Last week's TDN theme was Wheat Whiskey, so I came up with a couple drinks to contribute, my first submission being the Last Straw. This was my second drink, also a variation of a classic. 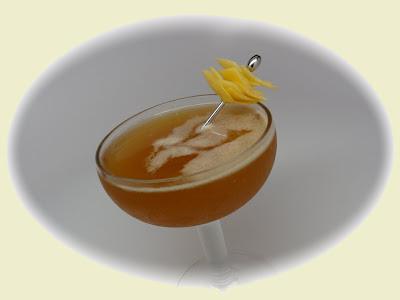 This time I opted to riff on the Corpse Reviver #2, partially because I had a fun variation of the name, but in no small part due to my wanting to make use of my newly acquired Bonal, a slightly bitter but delicious aromatized apéritif wine. It's delicious on it's own on the rocks with a twist, but I thought it might be fun mixed as well. This drink what right up my alley and I intend to add him into the starting lineup. Like the Corpse Reviver, it's a bit tart and a bit sweet from the lemon triple sec, but this version has and added richness and bitterness from the Whiskey and Quinquina, respectively. Yum.